"I'm fine with keeping the PVEPD, but how are we going to pay for it?" This is a reasonable question, given that the PVEPD's updated FY2017-2018 budget was $7.5 million (before one-time cuts) and is estimated at around $10 million including all pension expense. 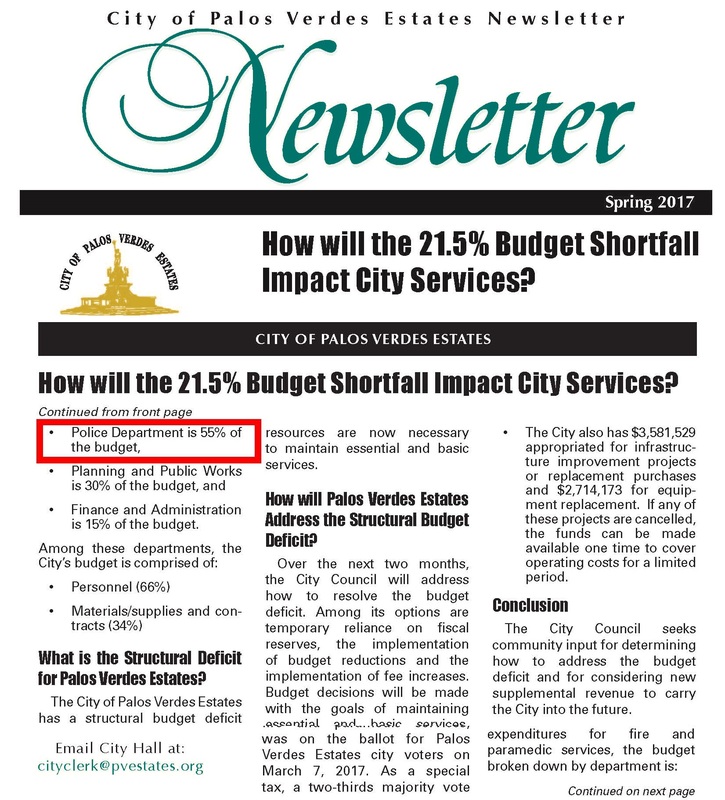 Residents may recall that the City has reiterated that the PVEPD represents 55% of the total PVE budget (click on image) using the smaller of the two costs. 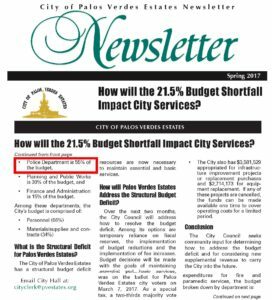 Moreover, City Manager Tony Dahlerbruch stated in January 2018, "The costs for the police services, regardless, are going up. The City has significant pension costs and insurance costs. The $5 million isn't going to cover the cost of the police department anyways." (click here at 1:46:25). As a result, there is a case to be made that PVE Treasurer Victoria Lozzi's April 4, 2018, "Go Back and Get it Right" Speech (click here) is even more applicable now after Measure E's passage than had it failed. With the City Council committed to a multi-year contract with the $7.5 - 10 million/year PVEPD, expense containment and revenue sufficiency have become urgent matters. Assuming the City's residents voted for the status quo on law enforcement via the PVEPD, our City needs to be sure it does all it can to be able to afford that luxury. To answer the question above, the BCHA devised a three-process solution to keeping our PVEPD while reducing the risk that its rising costs overwhelm the Parcel Tax set to be structurally flat at $5 million/year. The video slide show below is intended to be a talking point - something for PVE residents to consider and debate. Anyone who witnessed the BCHA's assertive approach to Measure E should realize that we believe proving and impeaching each others' assertions is healthy. Such a give-and-take should be a route to initial statements being accurate, all claims being verified, and eventually a "final truth" being discovered. Thus, critical commentary on the presentation's content not only isn't discouraged, but heartily welcomed. Help keep PVE ... PVE by "getting it right" with Treasurer Lozzi.